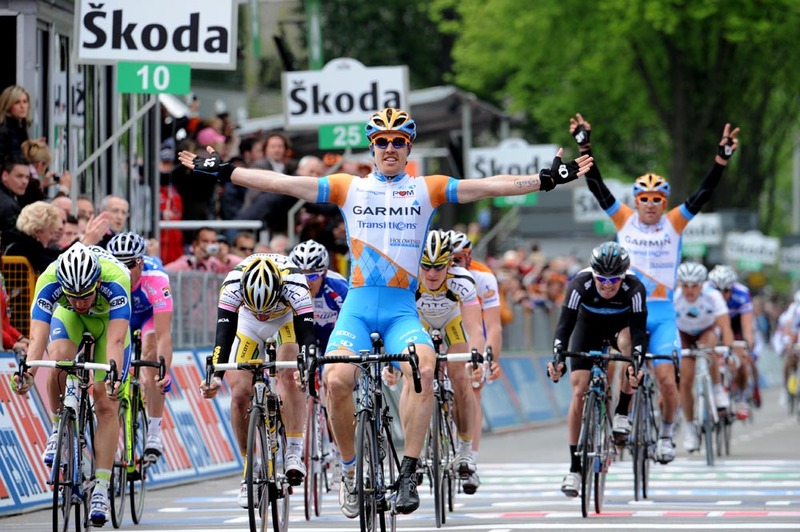 Tyler Farrar (Garmin-Transitions) took the win in Sunday’s crash-strewn second stage of the 2010 Giro d’Italia, which saw Bradley Wiggins (Team Sky) lose his race lead to world champion Cadel Evans (BMC Racing Team). The stage’s numerous traffic islands played a large part in the race, causing several crashes including one which split the bunch in the final run-in to Utrecht. Farrar, perhaps still running on adrenaline from a fall earlier in the stage, out-sprinted a reduced field of rivals to the win – his first ever Giro stage victory – from Matt Goss (HTC-Columbia) in second and Fabio Sabatini (Liquigas-Doimo) in third. Stage one winner Wiggins and the majority of Team Sky found themselves on the wrong side of the final split, and could only sit helplessly as the lead bunch were left to contest the sprint and the hefty 20 second win bonus. With so little time separating the top-seeded riders after the previous day’s opening time trial, the split meant the end of Wiggins’ brief spell in the pink jersey. Evans was the benefactor, moving into the race lead with Farrar in second, one second behind. Wiggins lost 37 seconds on the stage and dropped to 37th overall. Britain’s David Millar (Garmin-Transitions) finished in the lead group and moved up to fifth overall. One of the overall favourites caught in the same finishing group as Wiggins was Carlos Sastre (Cervelo). 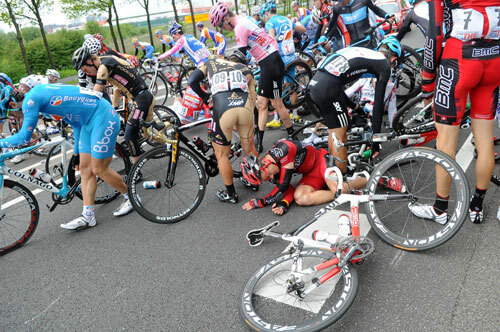 Losing so much time to his rivals on a flat stage is not a good start to his Giro campaign. He is now 74th overall, 57 seconds behind Evans. 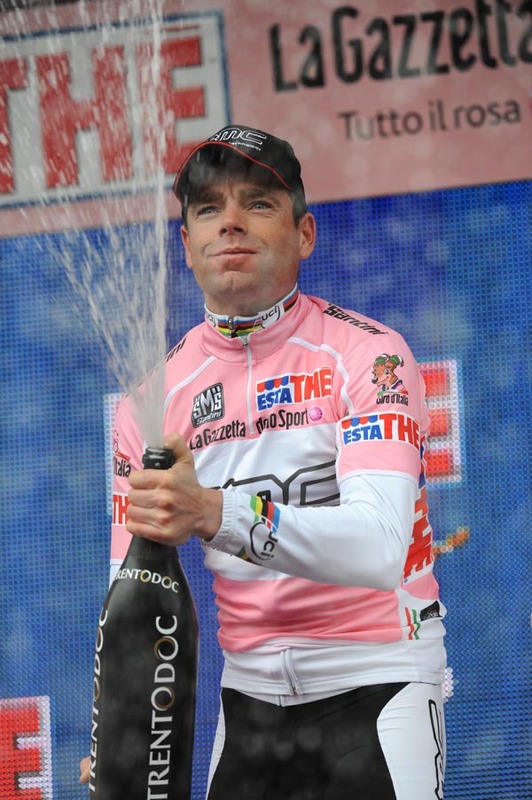 It’s Evans’ second time in the maglia rosa during his career. The Aussie took the Giro race lead in 2002, but lost the jersey on an ill-fated day in the mountains when he blew and went backwards in spectacular fashion. Earlier in the day, a four-man escape group took the initiative shortly after the stage commenced in Amsterdam. Mauro Facci (Quick Step), Rick Flens (Rabobank), Stefano Pirazzi (Colnago-CSF Inox) and Paul Voss (Milram) built up a lead of just over five minutes at its maximum but the bunch kept them within easy reach. They were caught around 40km from the line. 10. Sacha Modolo (Ita) Colnago-CSF Inox all same time.